Shari Raider founded Sauvie Island Organics in 1993, and is dedicated to growing a wide array of high quality seasonal produce for local markets. The farm markets its produce through a 200-member Community Supported Agriculture (CSA) program and to many of Portland’s premier restaurants. Over the years, the farm has demonstrated its commitment to the community by hosting educational programs, coordinating volunteer work parties, organizing seasonal farm festivals and playing host to numerous school groups connecting urban youth with farming. Looking for land to farm, Shari moved to Portland after receiving a certificate in Ecological Horticulture from the University of California at Santa Cruz (UCSC). Before entering the Farm and Garden Program at UCSC, Shari worked and apprenticed in some of the finest restaurants in California’s Bay Area. Shari apprenticed at Chez Panisse, Le Trou and The Acorn Café, then spent a year cooking at Greens in San Francisco. “I had the privilege of being taught by great chefs who truly believed in the phrase ‘buy local’,” she says. Shari earned a BA from Cornell University, majoring in Hotel and Restaurant management. While there, she ran a weekend food program at a local community center. Every Saturday and Sunday, people gathered for a free hot meal they could not otherwise afford. Each week, local restaurants and businesses donated food to feed the community. An Oregon native, Cory Schreiber opened Wildwood Restaurant in 1994 and rapidly became a leader in the region’s bustling culinary scene. Cory won the James Beard Award in 1998 for Best Chef Pacific Northwest – a fitting tribute to a man who cherishes the land, its people, and produce much in the same way Beard, a native Oregonian himself, did. 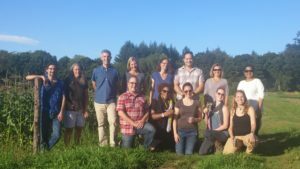 After leaving Wildwood in 2007, Cory applied his considerable experience and knowledge of local food as the Farm-to-School Program Manager at the Oregon Department of Agriculture. In this role, he helped develop a program that connects Oregon’s K-12 schools and local farms, with the goals of serving healthy meals in school cafeterias, improving student nutrition, providing educational opportunities in nutrition and agriculture, and supporting Oregon’s farmers. Cory is the author of two cookbooks: Wildwood: Cooking from the Source in the Pacific Northwest, (Ten Speed Press, 2000) and Rustic Fruit Desserts (Ten Speed Press, 2009, co-authored by Julie Richardson). Aly grew up on a Christmas tree farm outside of North Plains, OR. Her parents started bringing her to Sauvie Island to pick berries, peaches, and pumpkins when she was 6 years old, and she’s been trying to find excuses to spend time there ever since. Aly teaches 6th, 7th, and 8th grade Language Arts at the island school and every year brings her 7th graders to the Sauvie Island Center for a field trip as part of their Food Unit. Aly strongly believes that food is tied to culture, and that teaching kids how to eat and appreciate where their food comes from is as important as teaching them the difference between a comma and a semi-colon. In her spare time, Aly enjoys hiking, reading, drinking coffee and wearing wool socks. Despite growing up in the Garden State (New Jersey) and having a small backyard garden as a kid, Rich didn’t really think too much about where his food came from until he moved to Oregon after college. That’s when he started shopping at farmers markets and natural food stores, and connecting the great flavor and high quality of the local produce to the hard work and commitment of local farmers. Rich joined the CSA at Sauvie Island Organics in 2002, and has been a member ever since. After a successful career in software development, Rich returned to school in the Fall of 2014 and completed an MBA degree with a focus in sustainability at Portland State. After graduation, Rich began an internship at Oregon Food Bank, where he works on special projects for the group responsible for sourcing the food they distribute. Rich feels very passionately about food issues, and hopes his future career path will enable him to address some of the many problems of the conventional food system. When not working or studying, Rich enjoys spending time outdoors hiking, backpacking, cross country skiing and bicycling, and time indoors cooking, knitting and dancing many different forms of dance with his partner Francine.